In the article on Ada Brunn-Hoffmeyer's sword typology, there is mention of a sword with a brazil nut pommel from Rouen in Chateau Gaillard. Does this sword still survive? Where is it now? Are there photos and is there information about it? We would never know either this sword still survives to this this day or not. (L. 670 mm ; 1. 62 mm). Provenance : Le Petit-Andelys (27). Dépôt : Evreux, Musée municipal, N° Inv. 7084. - Medieval Catalogue, 1954, pp. 22 et 30, fig. I, n° III. - Rouen, Musée des Antiquités, une épée provenant de Paris N° Inv. III, 1803." 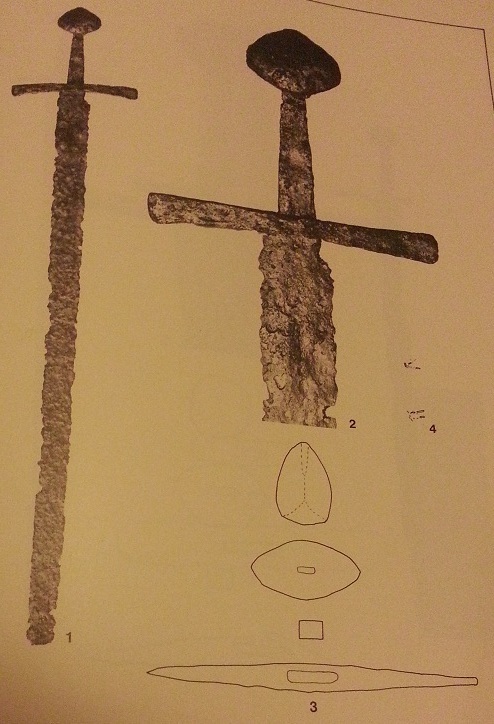 The sword seems to have lost a large portion of the blade since Bruhn-Hoffmeyer illustrated it, but the inscription and pommel are distinctive and consistent. So the sword has lost even more of the blade now? I am assuming the illustration comes from the book. Too bad we don't have a photo, as it's hard to say what kind of blade the sword had. It looks like it might have been Type X, but without the point of the sword I can't be sure. Actually this illustration is more recent and shows the "short version"... I think it was in a photo database of French museums. what puzzles me a bit is, how could it lose the crossguard without losing the pommel first ? obviously it could not happen without applying force. if the crossguard got lost due to natural rusting/aging processes, the tang, which is even thinner, would probably have broken first. There are other antique swords that survive with a pommel and not the cross, so this cannot be so unusual as you suppose. If the cross had impurities or other problems with the metal (I don't know much about metallurgy, hence my vagueness) it's possible that the cross might have broken when the sword was used. Alternatively, if the sword was buried in the ground or a river and the cross, but not the thinnest part of the tang, was exposed to material that would corrode it, the cross might have been in poor condition when the sword was recovered. Both of my ideas are just speculation. Perhaps someone more knowledgeable could contribute their insights. What is your interest in this sword Craig? I'm hoping that you want to have it made Craig... It would be a gorgeous sword. After seeing that drawing, I think someone has to step up to the plate and have it made.... That inlay is just awesome! If the cross had impurities or other problems with the metal (I don't know much about metallurgy, hence my vagueness) it's possible that the cross might have broken when the sword was used. Alternatively, if the sword was buried in the ground or a river and the cross, but not the thinnest part of the tang, was exposed to material that would corrode it, the cross might have been in poor condition when the sword was recovered. i think, the metallurgy point you bring up is very important. i (and probably most of us) usually tend to have a picture of metal in mind, that matches our modern material. understandable, as 99% of us only know modern replicas. i remember this also being brought as an argument by leo todeschini, when trying to explain, why medieval crossbows have such a high draw-weight, but such a low draw-length. You may have to lead the way Tim. At the moment, I lack the financial resources to make it feasible. Even if I did, there are other swords much higher on my list of priorities. The inlay is quite unusual and would certainly make for a striking reproduction. My interest in this sword, Doug, is mostly just curiousity. I like seeing Brazil Nut swords, particularly the later ones, and since I had not heard of this one before, I was interested to see if anyone knew more about it. Thanks to Mark, we now do. Looking at Geibig, the pommel to me seems to be most akin to a slender Geibig Type 15 Variation II pommel. That means it should have one of three cross guard shapes. The cross guards should be fairly short, something around the size of that seen on Albion's Reeve. The cross shape looking sideways at the sword should either be Gaddhjalt, bar, or bar with a very subdued bow tie swelling at the ends. Inlay wise, the style seems most akin to some of Oakeshott's pencil sketches of blades associated with Type X.a (see Type X.a 11-12), so I would probably go with a Type X.a. My impression is that silver is much more common on inlays than gold, but maybe someone else could chime in with better information. 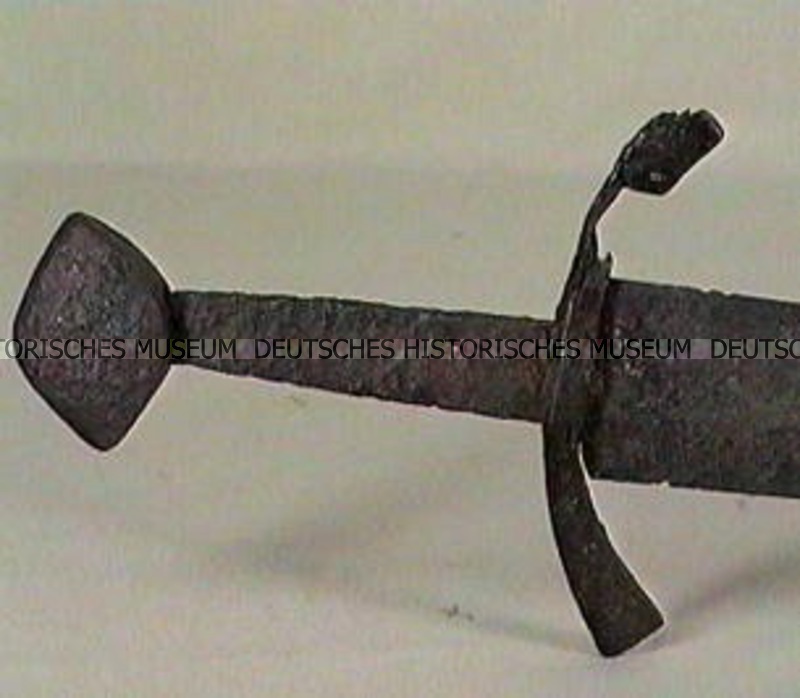 I've attached a picture of one such sword from Geibig. You'll notice that it combines the bar cross with subdued bow tie shape sideways on, but actually looks like a Gaddhjalt from the top down.